Tag Archive | "eating habits"
A new research suggests that the growing trend in sedentary jobs is one of the major factors in the increase of obesity cases in the United States. Sitting in front of the computer for eight hours a day rather than working on the field means that American workers are burning 140 fewer calories per day than they did decades ago. According to a research study posted online on PLos One, we should put greater emphasis on promoting physical activities if we want to win the war against weight. Dr. Robert Graham said that the key in weight loss is monitoring the calories that come in and those that come out; and right now, Americans are taking in more calories than it is burning. Although both exercise patterns and eating habits affect we either gain or lose weight, a contradicting study suggests that our caloric intake is still the major reason why one third of our population is either overweight or obese. This is because the study has noted that our leisure-time physical activities have not really changed over the past years. Many, however, do not agree because based on a statistics report by the US Bureau of Labor, more and more active jobs (like farming and mining) have been replaced with sedentary jobs like office works and stay-at-home jobs. The authors of the study stated that only a quarter of Americans are performing the prescribed level of exercise. Keri Gans of the American Dietetic Association said that the growing demands of our everyday life are eating our time for exercise. However, she said that it is necessary that we make time for it to fight obesity. Scientists have discovered a gene that is linked to cholesterol and diabetes acts like a master switch that may control fats in the body. Scientists say that this can play a huge role in getting obesity help and cure for obesity-related diseases. British researchers said in a study published in “Nature Genetics” that because fat plays an extremely significant role in our chances of getting metabolic diseases, the regulating gene may be targeted for the treatment of illnesses such as diabetes, obesity, and heart diseases. Tim Spector, lead author of the study, said that their study is the first major research that shows how very minimal changes in a single master regulator gene can affect metabolic functions of other genes. They analyzed at least 20,000 genes in fat samples from 800 British female twins who volunteered for the study. After which they compared and confirmed their findings with 600 more fat samples from another group from Iceland. As of the moment, one out of 10 adults in the world is obese. That is more than a billion people or 10% of the world’s total population. The numbers have increased, almost doubled, since the 1980s and it has shifted from rich nations only to even poor countries because of poor eating habits. 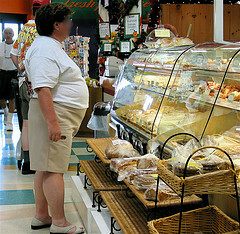 In the United States alone, $147 billion are spent to treat obesity-related diseases each year. That accounts for 10% of the country’s total medical spending. Cases of type-2 diabetes are also increasing in number as obesity rates grow.